Since I’ve been a wannabe minimalist, I’m all about experiences not things. This year for our birthdays we decided rather than gift each other presents that we neither want nor need, we would instead gift ourselves a weekend away (which we both wanted and needed.) 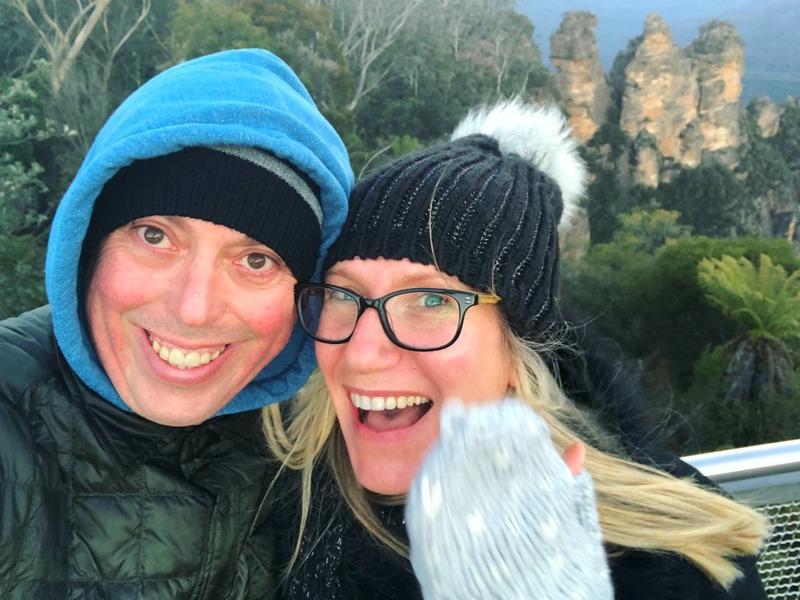 Our birthdays are just under a week apart so we split the difference, packed our thermals and headed up to the Blue Mountains for the weekend in between birthdays. 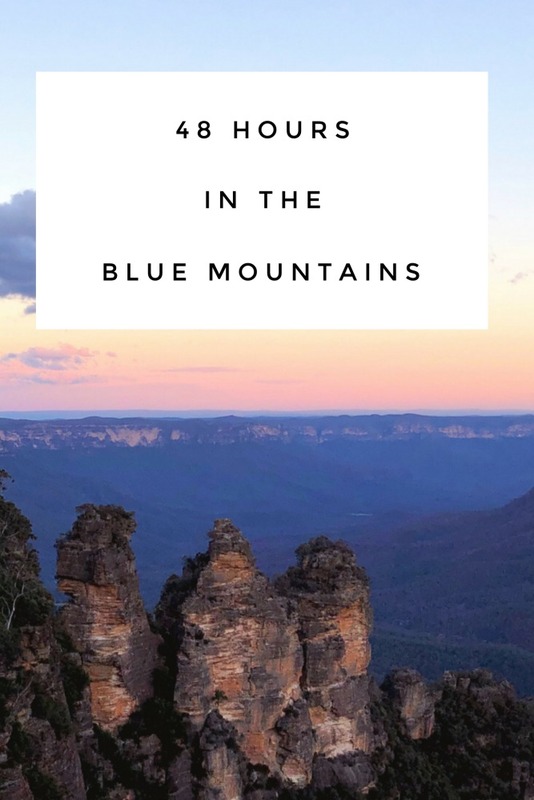 The Mountains are my go-to weekend destination – they’re easily accessible from Sydney by car or train and when you get there, you can be rest assured you’ll find great food, amazing vistas and plenty of things to see and do. 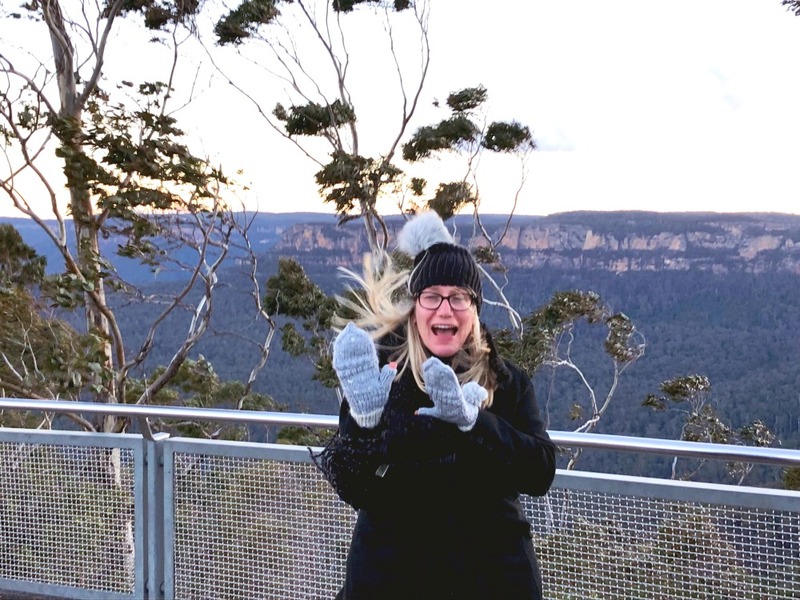 We’re quite the fans of 48 hour mini breaks and are dab hands at jam packed itineraries – check out our fun filled adventures in Canberra, Melbourne and Edinburgh if you don’t believe me. However our aim for our 48 hours in the mountains was to do less and rest more with a few choice, cherry picked activities. So here’s what went down – where we stayed, what we ate and what we did. We’re all packed and ready to go and the car does not want to play along. This seems unreasonable because as cars go, ours is very sedentary and gets lots of time to rest and recharge. 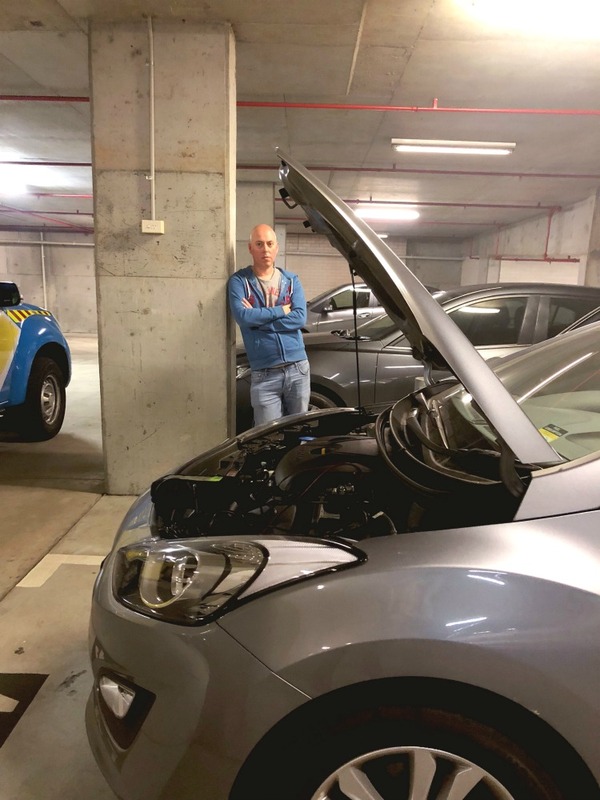 David is not happy with the car but is happy with the NRMA who quickly and efficiently fix our ride and before long, we’re off on our merry way, roadtripping to the mountains. 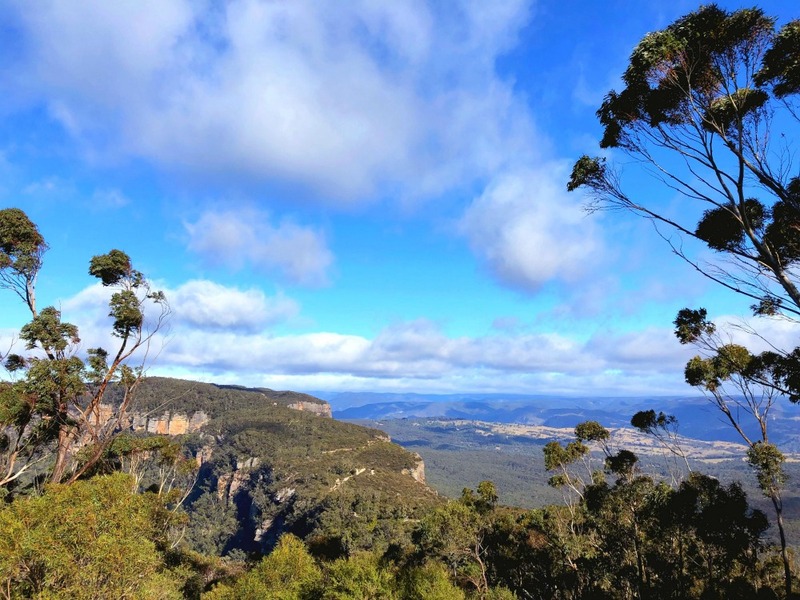 We have grand plans to stop off en-route to Katoomba but that was before the car drama. Plan B is to head straight to our B and B and make ourselves right at home. We have actually lost count of how many times we’ve stayed here but I do know we must be in double digits because it’s the first and only B and B we’ve stayed in since we first weekended in the mountains 10 years ago, and let’s just say we’ve spent a lot of weekends in the mountains! 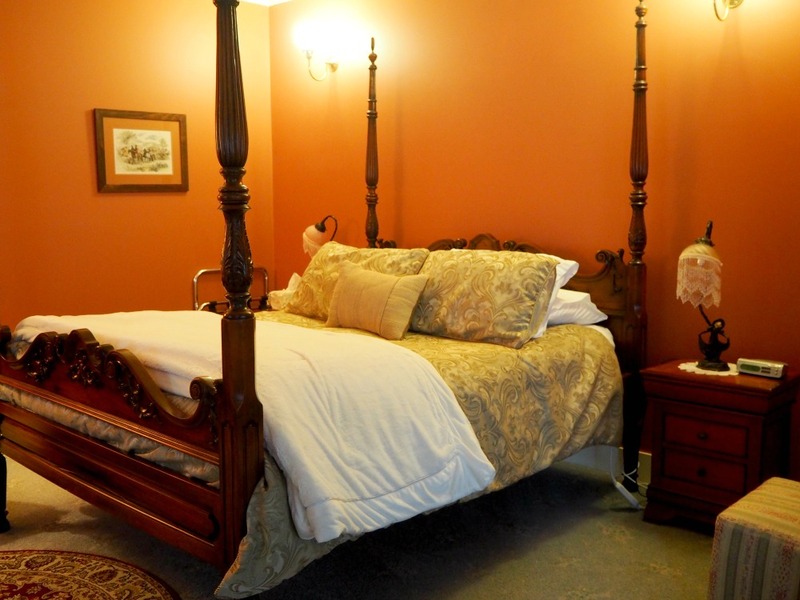 This weekend we’re staying in the Amaroo Suite, our favourite of the three. 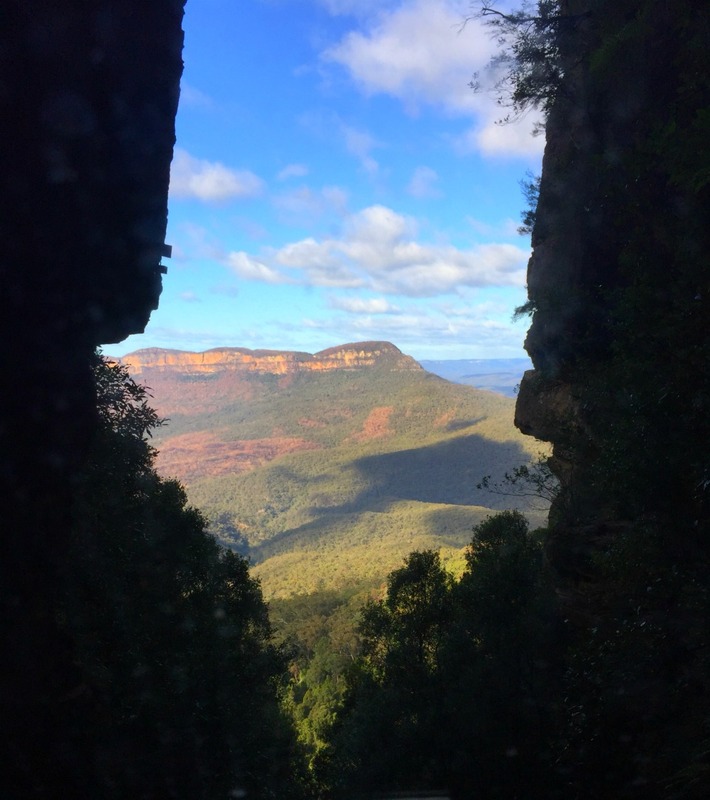 In fact, I love this place so much that once I wrote a blog post about it (not sponsored, just a fan girl.) The welcome from our host, Paul is as warm as ever, and talking of warm, we waste no time in toasting ourselves by the fire. Baby, it’s so cold outside! 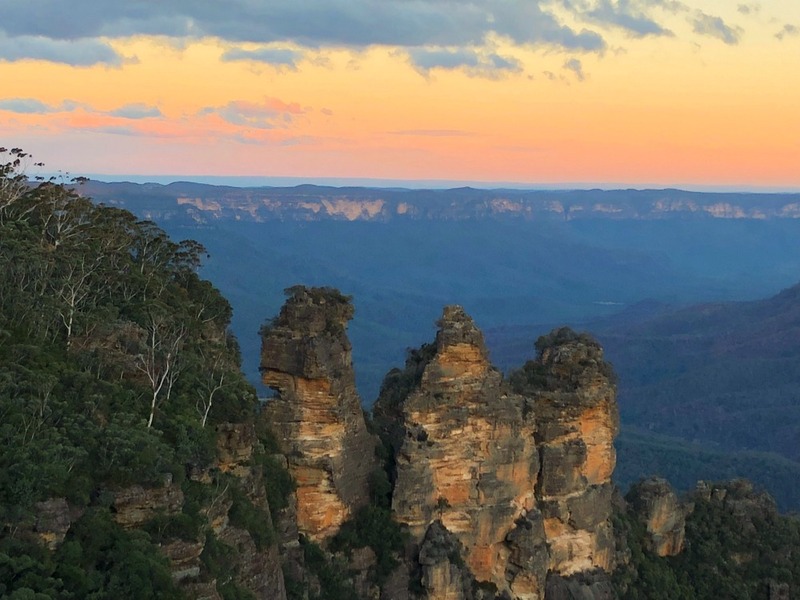 As hard as it is, we extract ourselves from the fireside and walk down to Echo Point because who can resist seeing sunset over the Three Sisters? Not me! It’s a relatively short walk down to Echo Point although it feels like a marathon hike due to the armageddon-esque winds. Look, even the trees are blowing sideways! Despite the adverse weather conditions, I have to take a moment to soak up the scenery. This is totally my spirit place! It’s so windy we almost get blown away (literally.) This weather is not for hanging around so we snap a selfie with The Three Sisters and make a hasty retreat. A lot has changed since our last visit to the mountains in 2015. I can’t believe we have left it so long! The Lookout at Echo Point is a most welcome addition to the area, incorporating a Milk Bar, Restaurant 1128 and Bar NSW in the one spot. The former two options are closed but luckily the bar is open and very inviting it looks too. 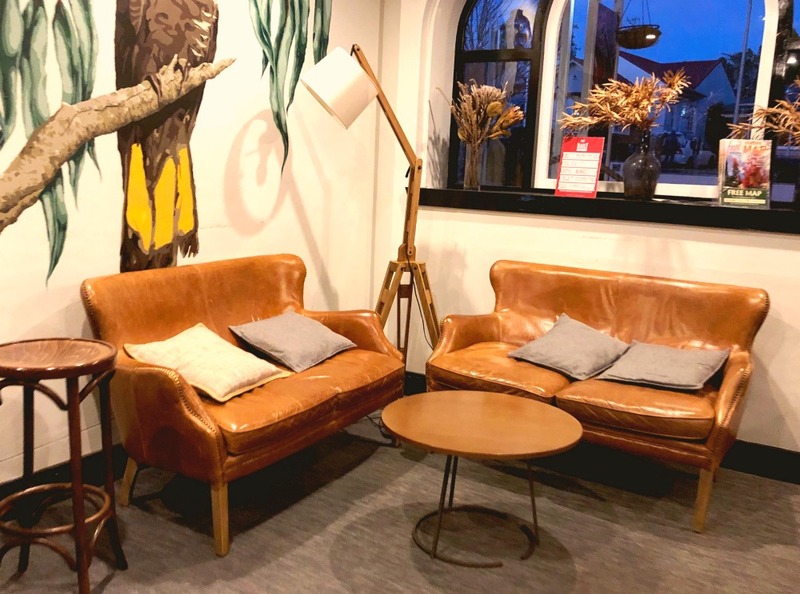 There’s a relaxed, open space with some cosy corners, a bar menu and a decent selection of NSW wines. 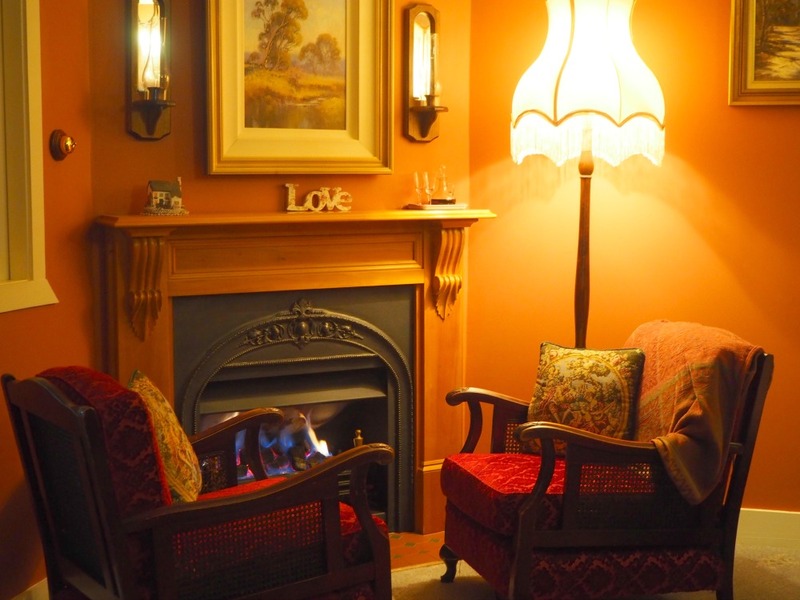 It’s the perfect place to warm ourselves up and one glass of wine later, we’re ready to face the elements. All that blowing about has worked up quite an appetite and we brace ourselves for the uber-breeze and walk into town for sustenance at Palette Diner. Our visit here brings back so many happy memories of when this place was Bistro Niagara which closed a few years back. Palette is a multi-restaurant operation, with a fine dining restaurant downstairs and a relaxed, informal diner upstairs. David’s love of dude food takes us upstairs to the diner which has a cool but friendly vibe. Service is warm and attentive, there’s a great cocktail list, an impressive selection of craft beers and a limited selection of house wine. The menu is mostly burgers and ribs with some tasty sides. The food does take a while to come out but when it does is fresh and cooked to perfection. 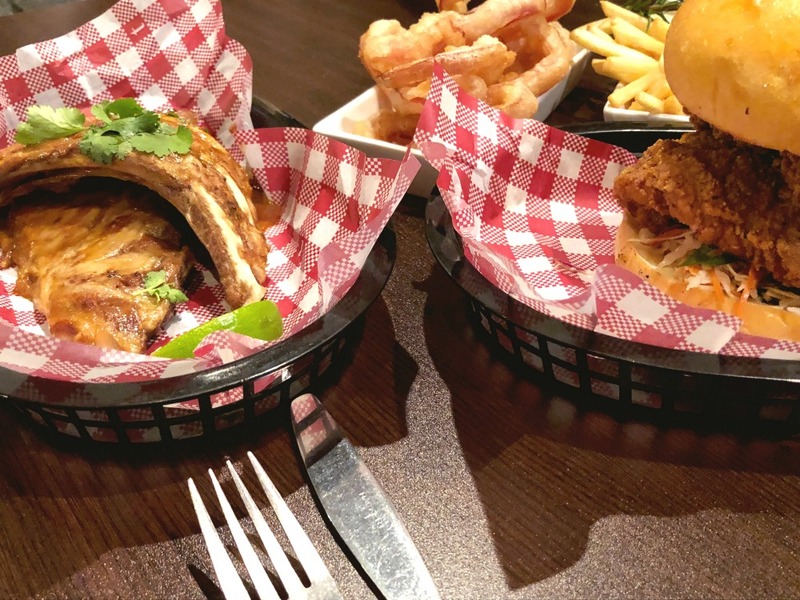 David cannot resist the Gus Burger with it’s two bits of fried chicken, candied jalapenos, slaw and American cheese all served on a brioche bun. 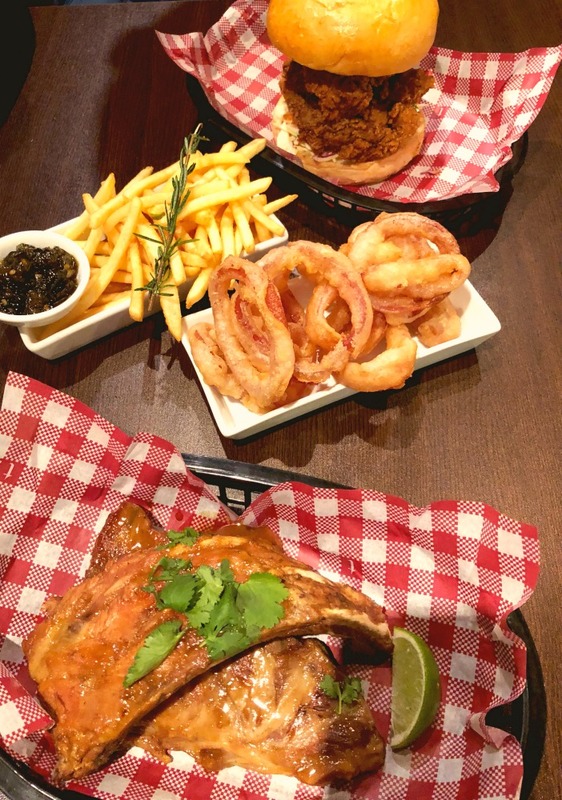 I officially become the fourth little pig with my Three Little Pigs Ribs and the Salt and Vinegar Onion Rings are side dish perfection – thick slices of red onion, in a light, crispy batter. I’m a happy little porker! One of the things I love most about Shelton Lea is the home cooked breakfast delivered direct to your door! You just choose what you want and when you want it the night before and Paul and/or Jenny bring the breakfast of your bidding. This morning David has gone for the eggs and bacon combo but I am all over these pancakes. They’re the business! If I’m honest this is the part of our trip that I’m most excited about. It’s been way too long in between visits to Scenic World which has to be the most exciting way to see and discover the mountains. There are four main attractions here, the Scenic Railway, the Scenic Skyway, the Scenic Cableway and the Scenic Walkway – and they’re all scenic by name and scenic by nature. We can’t wait to get started. 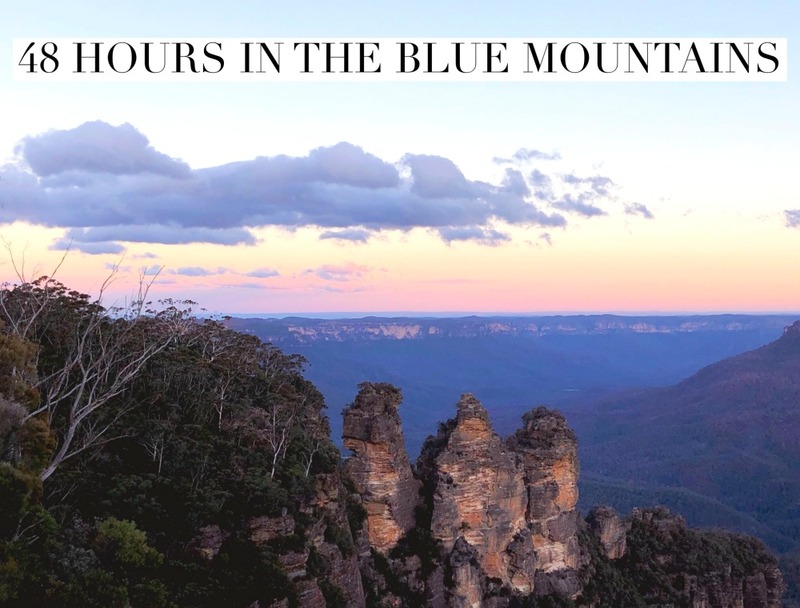 Scenic World is the biggest tourist attraction in the Blue Mountains and it is almost always busy so it’s a good idea to arrive early to avoid the crowds. We’re quite the early birds and there’s no queue at the Scenic Skyway and we walk right on to the largest aerial cable car in the southern hemisphere. This is where I remember that I am terrified of heights but I don’t have time to feel the fear, as I am too busy enjoying the 360 degree mountain views, looking down through the electro-glass floor at the Jamieson Valley and listening to the commentary as we glide past Katoomba Falls and the Three Sisters, gliding between the cliff tops 270m above the ground. It’s pretty spectacular! 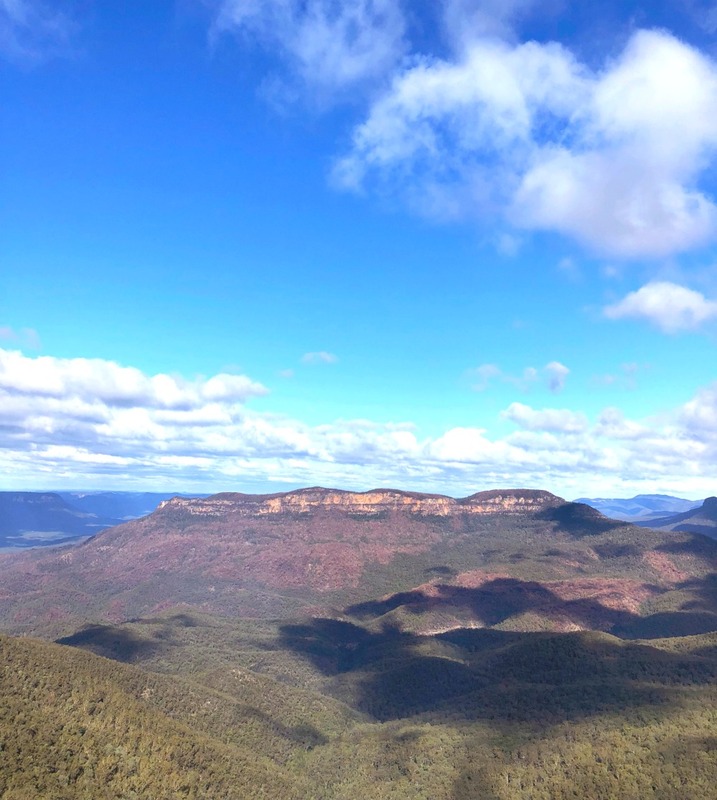 Arriving at the Skyway East Station, we have grand plans to walk around to Echo Point and then down the Giant Stairway via Federal Pass back to Scenic World. It’s a good 2 hour walk and one we’ve enjoyed many times before but today it’s just too windy and I fear we will just get blown away. Instead, we make a return trip on the Scenic Skyway and the 720m journey is just as awe inspiring the second time as it is the first. I am pleased to report that despite the high winds out the skyway doesn’t sway which warms my height fearing heart! 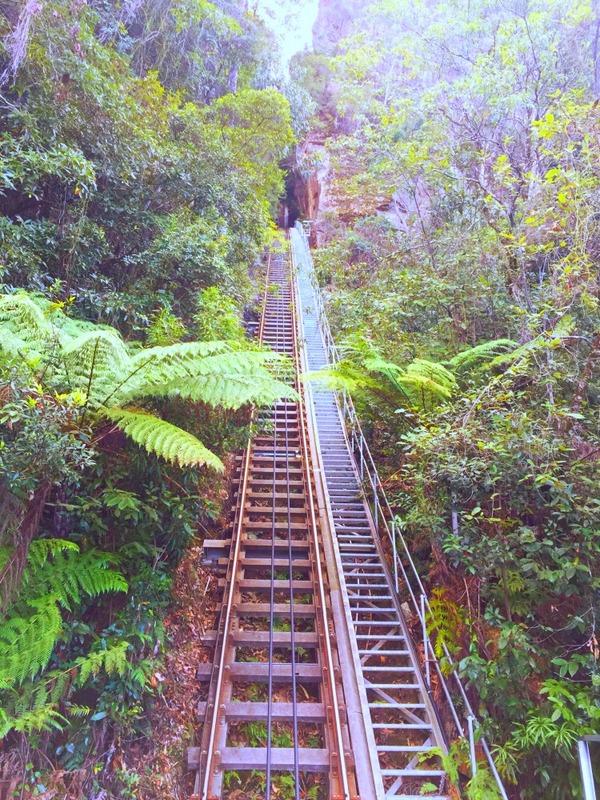 I am almost beside myself with excitement at riding the new improved Scenic Railway which at a 52 degree incline is the steepest passenger train in the world. I’ve taken this train trip a few times but not since the railway was re-opened in 2013 with new glass roofed carriages and the opportunity to choose your own adventure by adjusting the angle of the seat by up to 20 degrees! 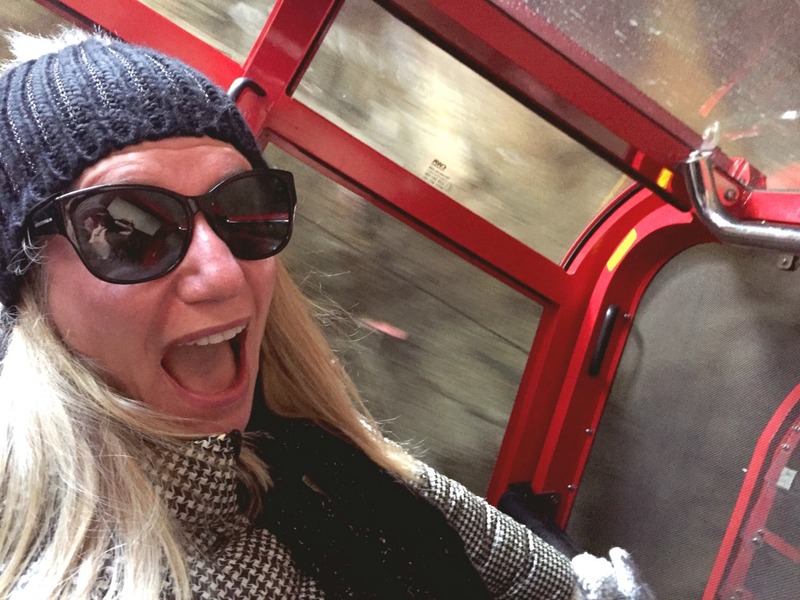 You can opt for a ‘Cliffhanger’ ride at a steep 64 degree incline, or for a more relaxed ride there’s the ‘Laid Back’ option. Traditionalists can still ride the ‘Original’ at 52 degrees but we go for the Cliffhanger because you only live once, right?! There’s heaps of history to look at before you select your ride – operating since 1945, the Scenic Railway has thrilled more than 25 million passengers! Can you believe? Before we know it, the Indiana Jones theme tune is on and we’re descending 310m through the cliff-side tunnel emerging in to the valley below. 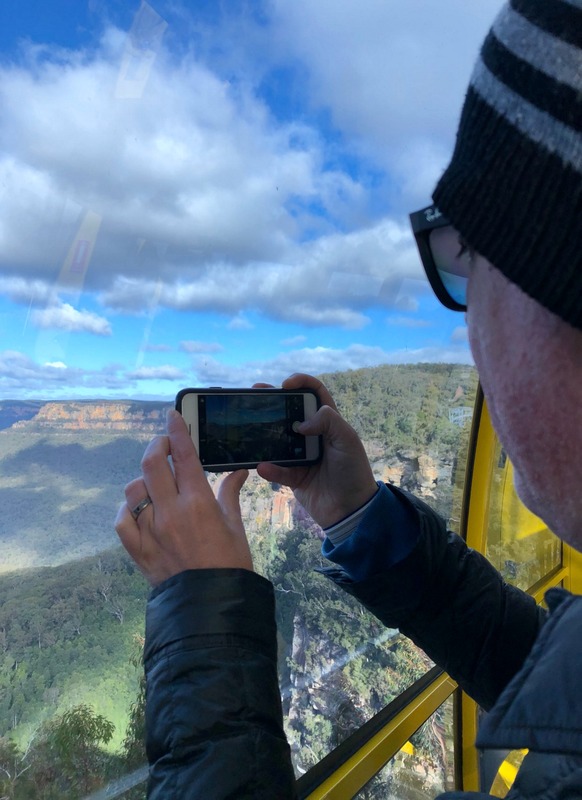 I can just about keep my eyes open on the way down and just as well, because the views of the rainforest and the Jamieson Valley are just incredible. That’s got to be the most exciting thing I’ve ticked off my list of 101 things in 1001 days. Here I am remembering my fear of heights on the way down! Once you get down to the valley floor, you can take a walk on the wild side through the ancient rainforest. 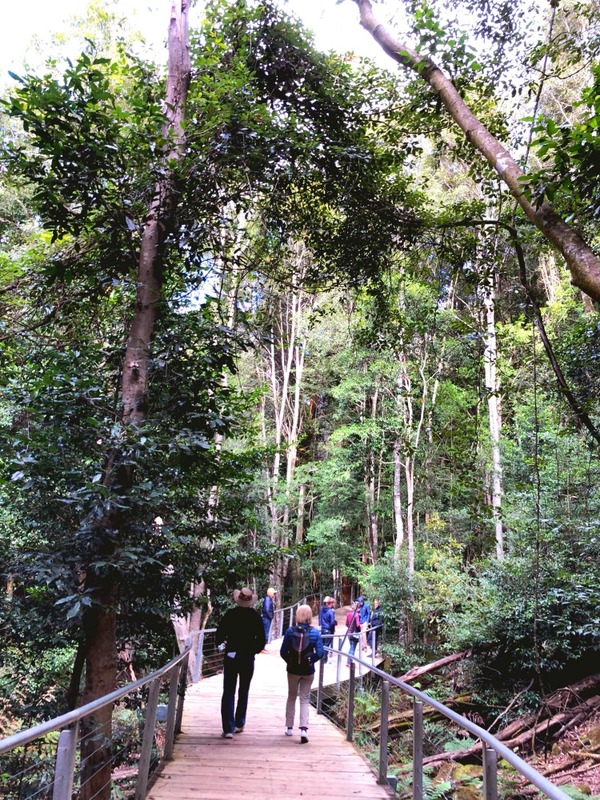 There are a variety of walks to choose from ranging from 10 minutes to almost an hour – you can learn about local fauna, explore the area’s mining history, experience the tranquility of the Rainforest Room or simply take the weight off your feet and one of the perfectly positioned benches . It’s lovely and cool down here and the Scenic Walkway certainly lives up to it’s name. Our walk takes us back to the Scenic Cableway Bottom Station. 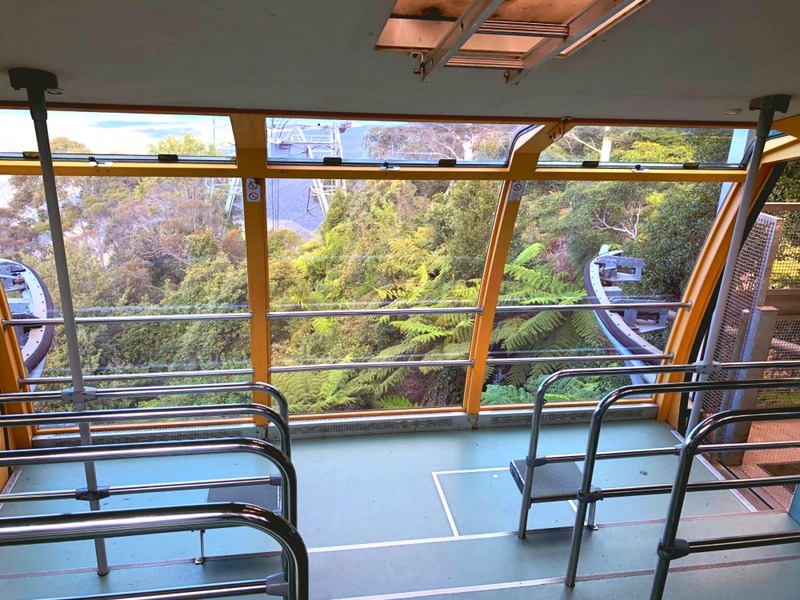 Here we are going to take the final ride in the Scenic trilogy and ride to the top via the Scenic Cableway which incidentally is the steepest and largest aerial cable car in the southern hemisphere. 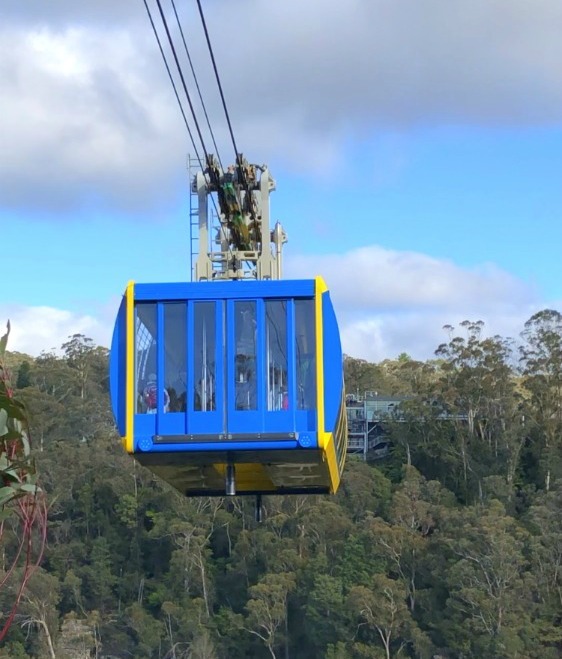 Cable cars have never been my favourite because they way they sway makes my nerve endings fray, however, the Scenic World version is a smooth ride indeed. Once again I’m distracted by the breathtaking views and the entertaining commentary and before I know it, I’m back on higher ground. One thing that stands out here is not just the scenery but the service. All the staff we meet are ready with a smile and go out of the way to make our visit as enjoyable as possible. There’s a great gift shop and if you like eating on higher ground, there’s a cafe with an elevation of 270m but I have neither the time nor the stomach for it. Next time though, because there will be a next time! A visit to the Blue Mountains isn’t a visit to the Blue Mountains without a visit to a lookout and besides, I just get enough of these views. This lookout is a favourite of ours because there’s lots of car parking but not a lot of walking to the viewing platform. Win, win! 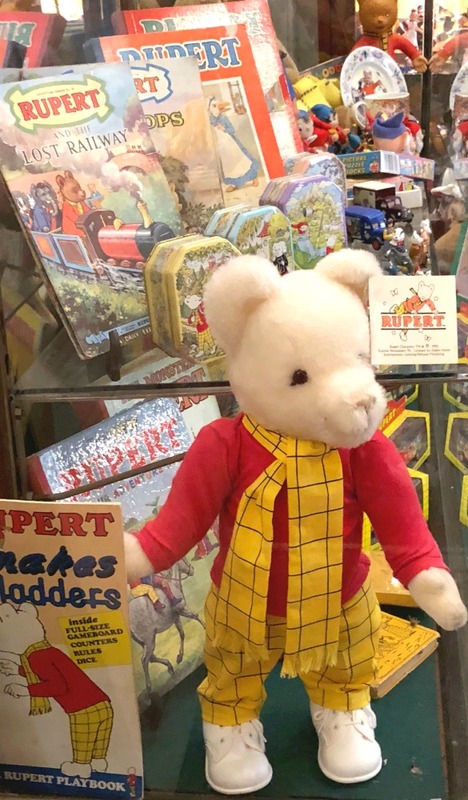 I can’t believe in all the years we’ve been coming to the mountains, that we’ve never been to Leuralla – home to the southern hemisphere’s largest collection of toys, trains and memorabilia. Popeye, Tintin, Noddy, Barbie and even Barbar, the gang’s all here and I am in my element taking the most delightful trip down Memory Lane. The quality and quantity of toys here is first rate and they’re all displayed in a historic 20th century mansion, Leuralla. 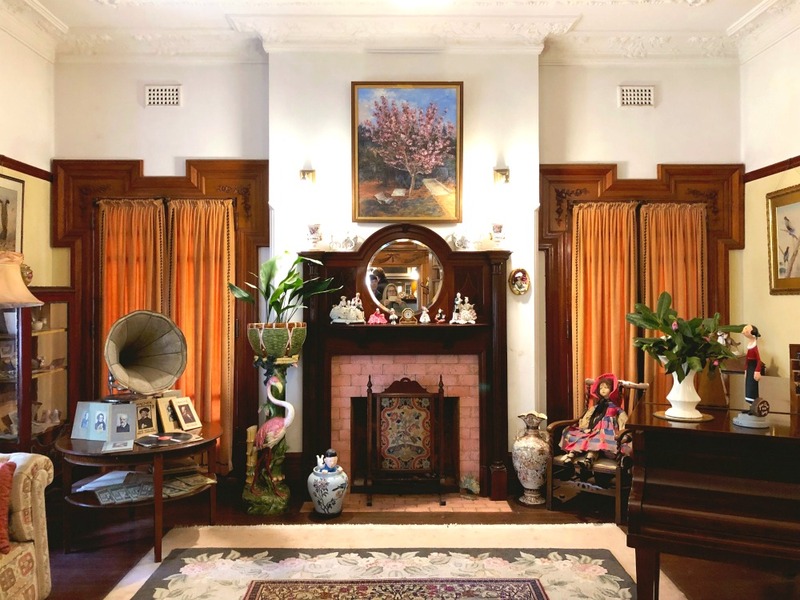 This is a home that has been in the same family for generations and some of the rooms are frozen in time just as they were in the 1920’s and 1930’s. Everything is immaculately preserved and presented. Incidentally, although some of the toys in the museum have been donated, many are from the family’s own toy collection, and what a collection it is. 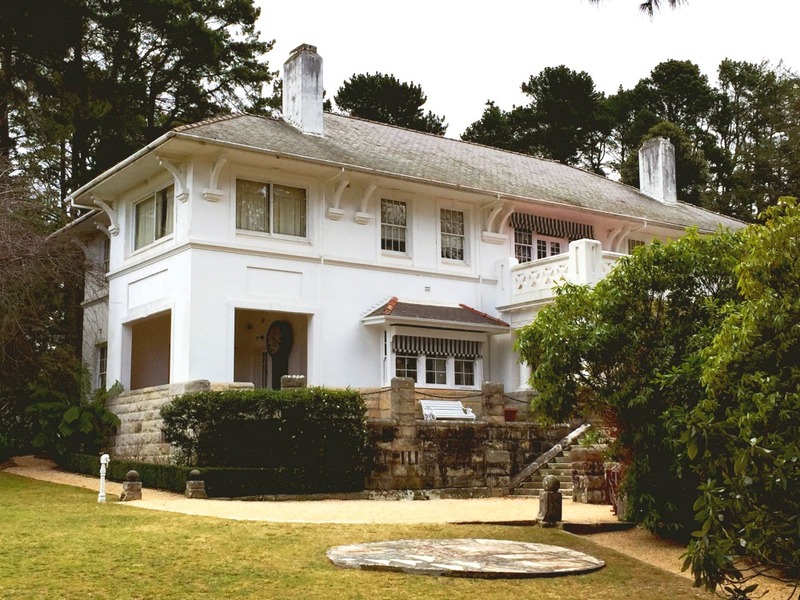 To the rear of the house, there’s a restored cottage, home to an wonderful collection of 1920’s-1950’s clockwork, electric and steam model trains, stations and figures. The cottage looks like an old fashioned railway station, complete with rails signs, signals and levers and it’s like taking a trip back in time. Be sure to bring some gold coins so that you can bring the model railway and the Matterhorn Garden Railway to life. The gardens around the house are beautiful but the real gem in Lerualla’s horticultural crown are the mountain gardens across the road. 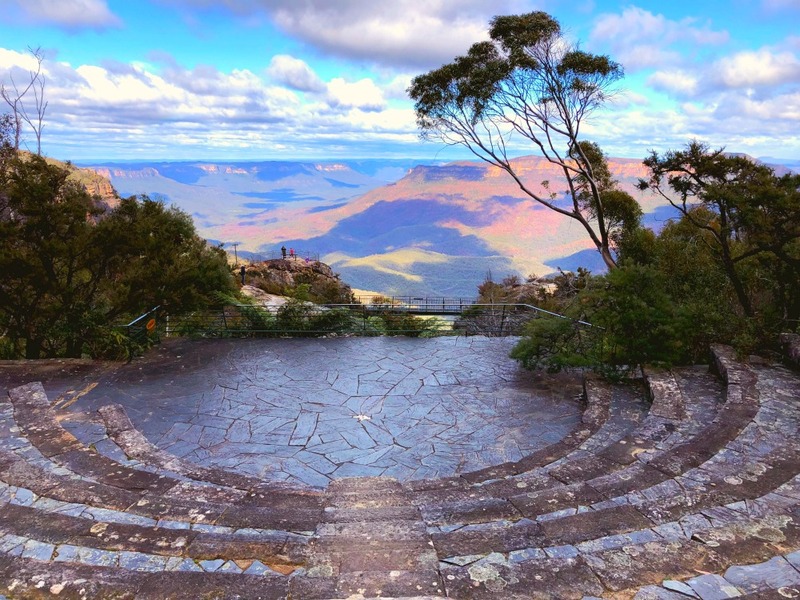 However, you’ll need a $2 coin to enter (on top of the $15 adult admission) but you won’t want to miss the spectacular amphitheatre and breathtaking views over the Jamieson Valley. I’ve always wanted to come for tea and scones here and today my wish is granted. I’m especially excited because it’s Yulefest and the tearooms are adorned with all things Christmas. 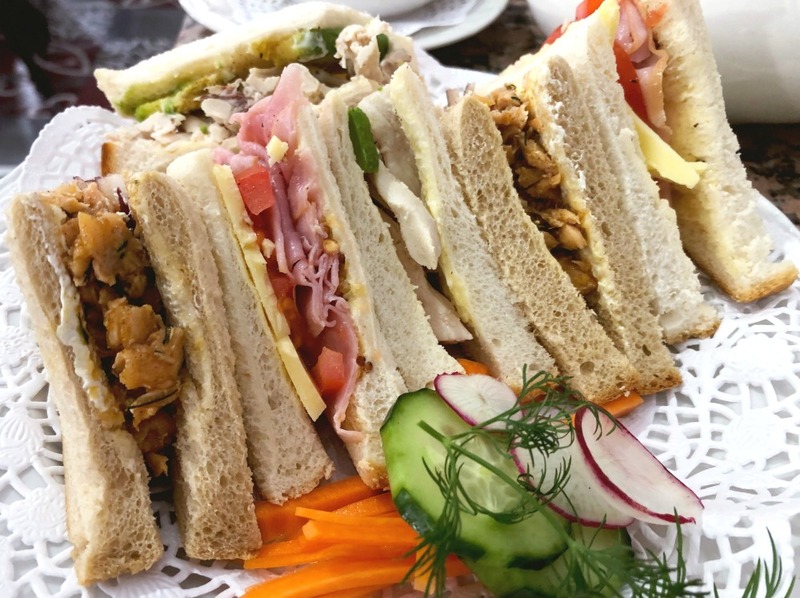 There’s a most luxurious dining room which is set aside for high teas (served with a very theatrical top and tails flourish,) so we sit in the regular tea room which although a little less luxe still has plenty of teapots. We’re here to try the house special, Devonshire Tea. 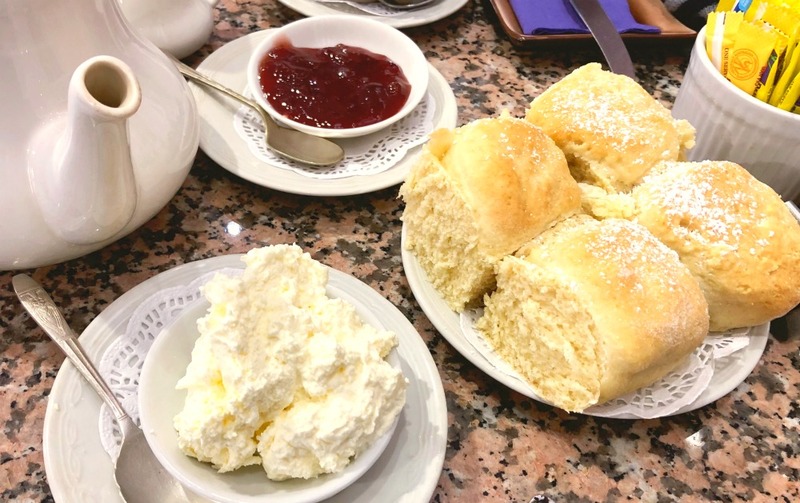 It’s not cheap at $16.50 but we have a voucher to buy 1 Devonshire tea, get 1 free which is just as well, because when it comes to scones, I’m not keen on sharing. The scones are light, fluffy and almost cake like in texture, but tasty all the same. We also order some sandwiches because you have to balance the sweet with the savoury, amirite or amirite? These are generously filled but then I would hope they would be at $14.95 a serve. 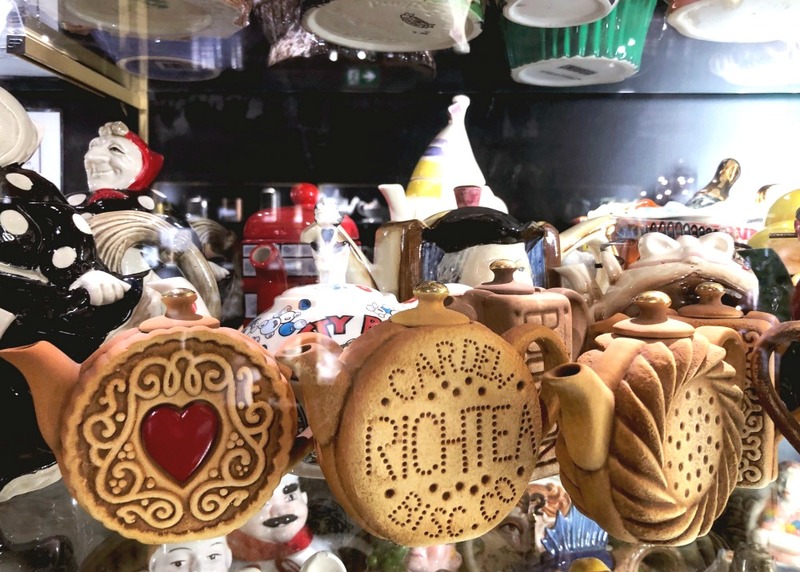 I can’t resist a peek in the Treasured Teapot Museum ($5.50 per person, redeemable against an equivalent purchase in tea room or gift shop) where we find the world’s largest private collection of teaware and very impressive it is too. In the 46 years he’s been collecting, the owner Maurice has amassed over 5,500 teapots from all over the world, and can’t stop and won’t stop collecting anytime soon. He tells me that it’s impossible to pick his favourite teapot and I can see why, although I am especially fond of these biscuit teapots, aren’t they the cutest? The shops here in Leura are just so pretty, I can’t resist a spot of window shopping up and down Leura Mall. Besides, isn’t window shopping the new cardio? It’s not long before the temperature plummets and snow (yes, snow!) starts to fall, so we decide to take refuge at Caffeine and Gasoline. Even though it’s late in the day, the place is packed and we feel lucky to have scored a table. 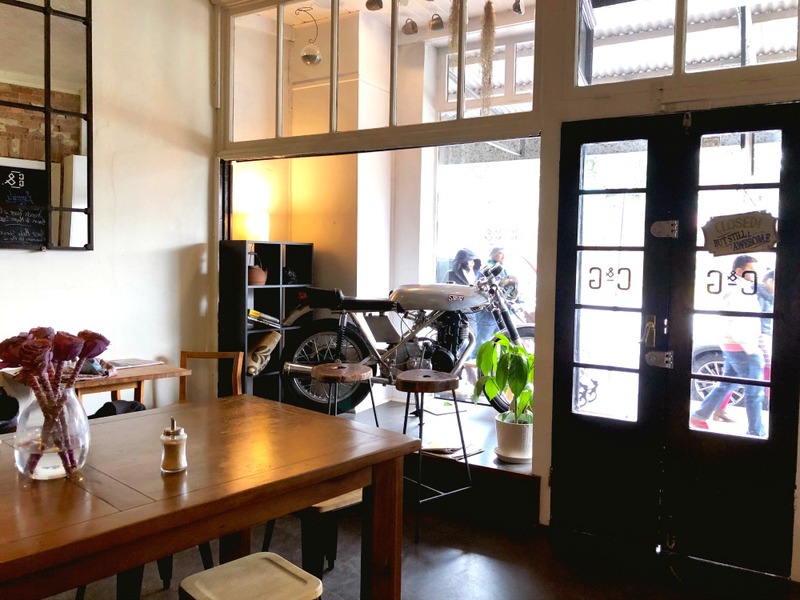 You can’t miss this place for the cafe racer in the window and you shouldn’t miss the coffee either. 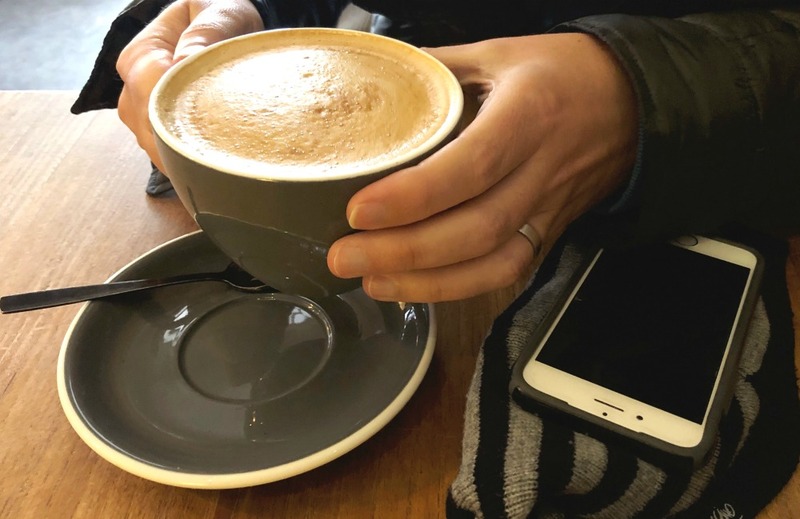 It’s very good – our flat white and long black totally hit the spot. The service is on point and the food looks fabulous too. Note to self: Next time return with an empty stomach! 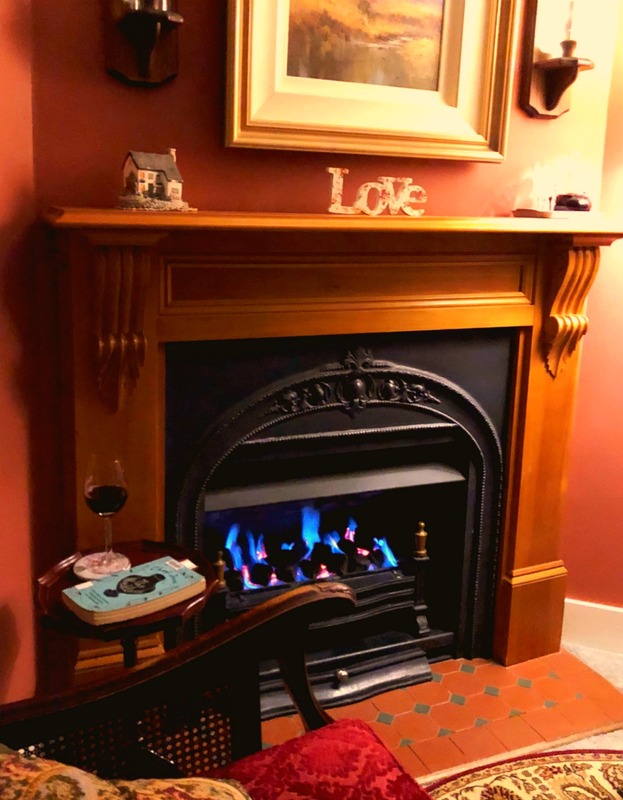 Back at the B and B, we warm ourselves up by the fire aided and abetted with a good book and a good glass of red. Jenny always leaves an afternoon treat, many of which have gone from my belly to my blog, like this Champion Chocolate Cake and this Date and Walnut Loaf with Maple Syrup but today Paul has left us some scones. How did he know they were my favourite?! Set in a historic old picture palace, this quirky Art Deco restaurant is one of my Katoomba favourites. First, we warm up by the fire in the lounge, with it’s retro tunes, eclectic collection of niknaks and a couple of class cocktails. 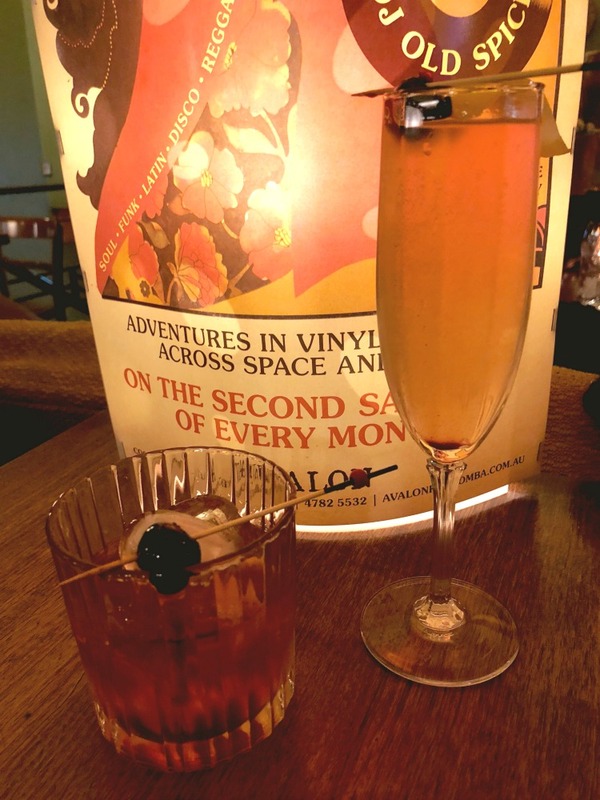 David chooses his favourite, an Old Fashioned and I channel my inner Parisienne with a French 75. With the exception of a few daily specials, the menu here never changes which is just the way I like it. We’ve been coming here for years and the food is always consistently delicious. Today we score a seat right by the big picture windows overlooking Leura and the Jamieson Valley. Even though it’s dark, with all the lights, it still looks pretty. This is the only restaurant I’ve ever been to where I order dessert before I order my main. 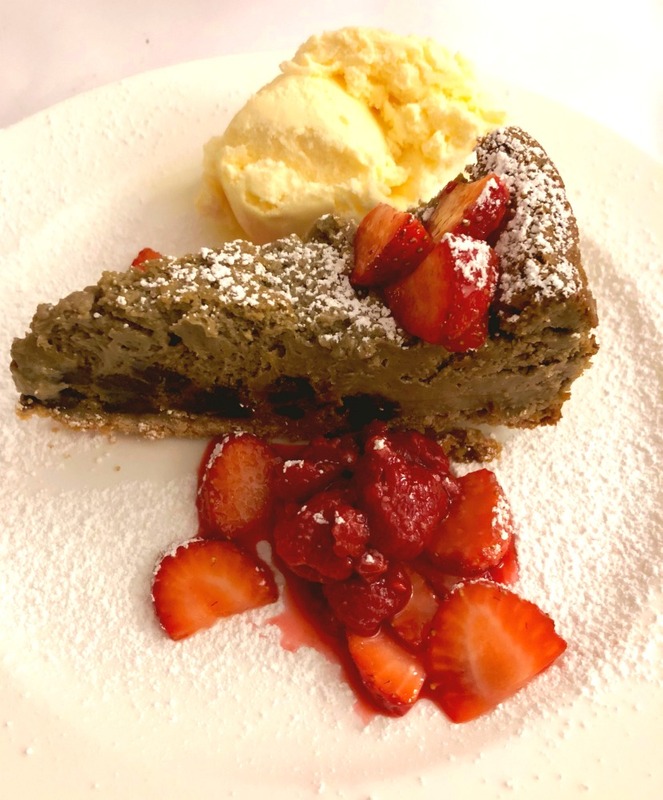 The thing is I love the Licorice Cheesecake here so much, I like to minimise my chances of missing out, so I always ask that a slice be set aside before I order anything else. Because priorities! As usual, my favourite dessert in the world does not disappoint! After another legendary breakfast, it’s time to hit the road. A bushwalk would be my activity of choice but the strong winds are making it an effort to stay upright so walking is off the agenda. 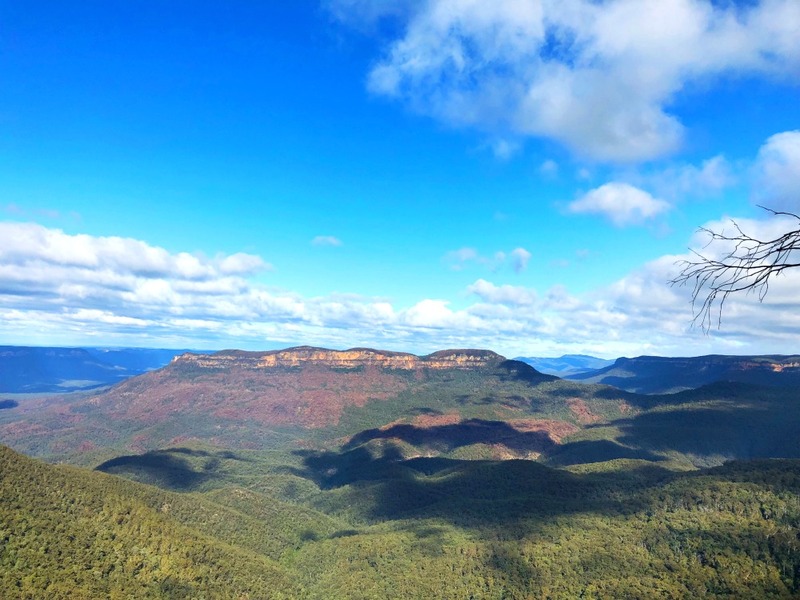 We compromise by stopping at some amazing lookouts as we head out of town, that way we are rewarded with breathtaking views without the windy walking. 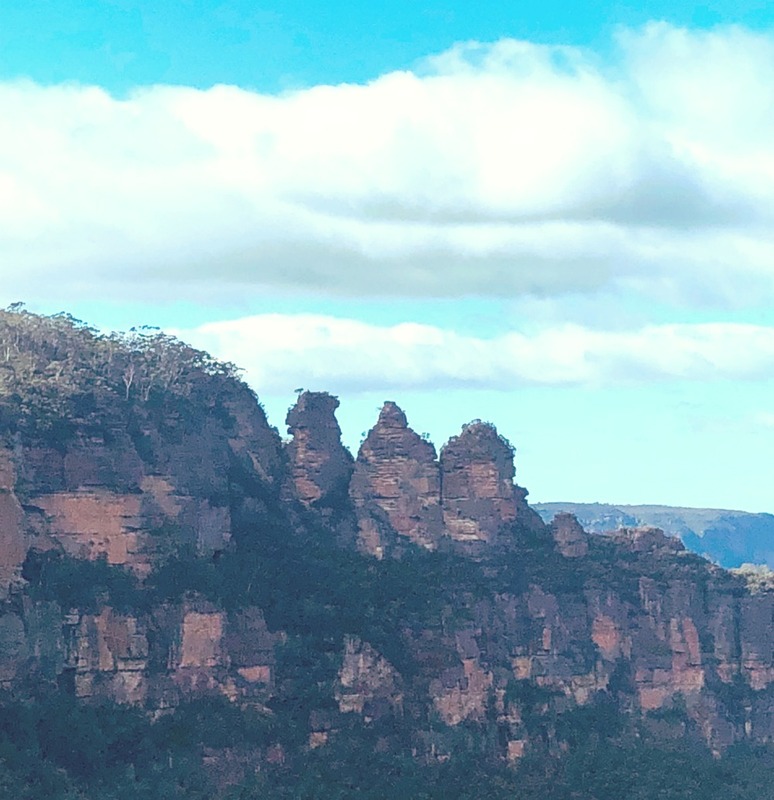 First stop is Eagle Hawk Lookout with it’s spectacular views of the Three Sisters and then on to Narrow Neck Lookout with it’s sweeping views of the valleys. It’s everything we love about the Mountains. This has been top of my mountains To-Eat list since I saw the rave reviews from my friend Lorraine at Not Quite Nigella. We planned to stop off on the way up to the mountains but our car crisis scuppered our plans but undeterred, I’m determined to swing by on the way down. 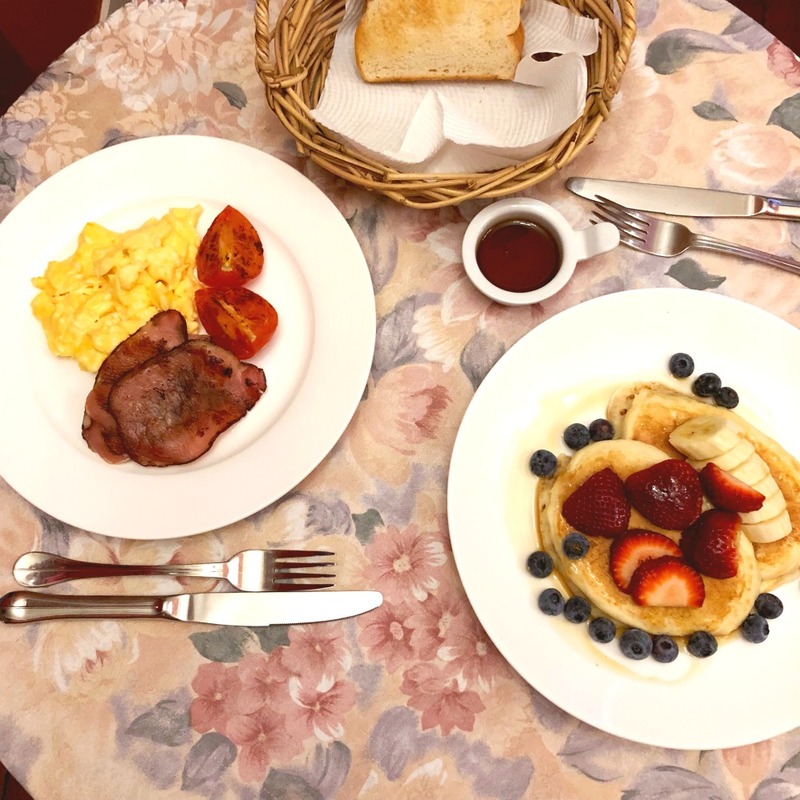 It’s a bit too close to breakfast to eat anything but then we see the menu and the amazing looking food coming out of the kitchen, we feel we should try and find some stomach space! David only has eyes for the homemade spam and cheese toastie which is absolutely next level. 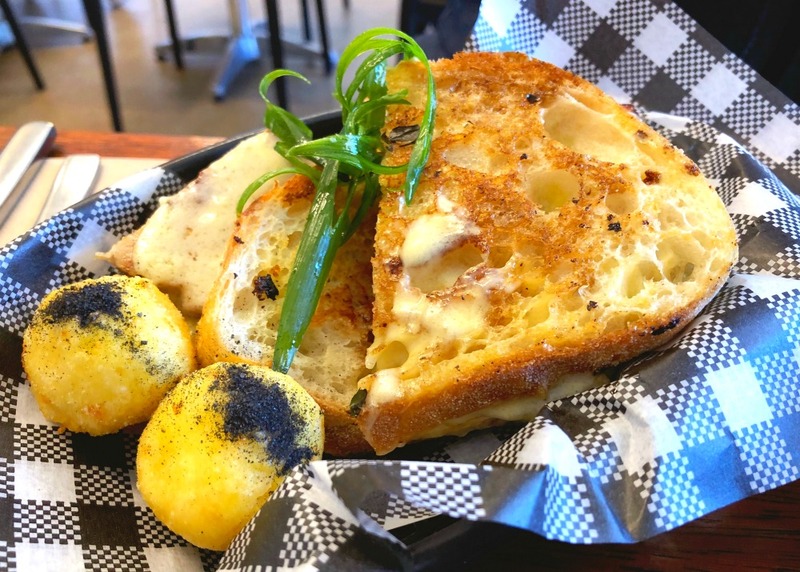 Now you know what a licorice lover I am, so you won’t be surprised to learn that I have to order a slice of the famous Kickaboom Licorice Bread. It has the texture of banana bread with the flavour of licorice and it’s utterly divine. I can not be left alone with a loaf of this, that’s for sure. 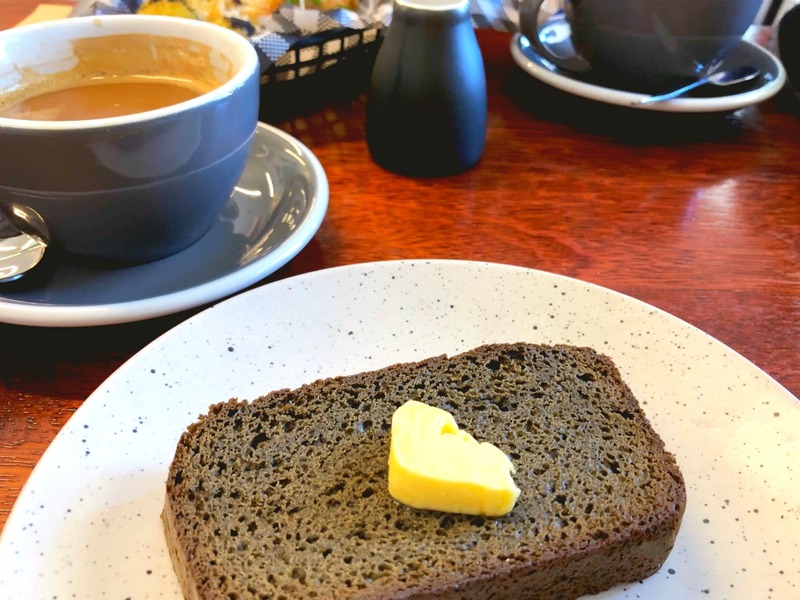 I’m very excited that Lorraine has shared her recipe for the Licorice Bread and I’m definitely going to be trying it at home. If you love licorice (or even if you don’t) I suggest you try it too! It’s one loaf everyone needs in their life! We time our visit just right because by the time we polish off our toastie, there is a queue of people waiting for a table. It’s understandable, this food is worth waiting for plus service is super friendly and the coffee is totally on point. And with full hearts and full bellies we headed home. Sometimes a change really is as good as a rest. What’s your favourite place for a weekend getaway? 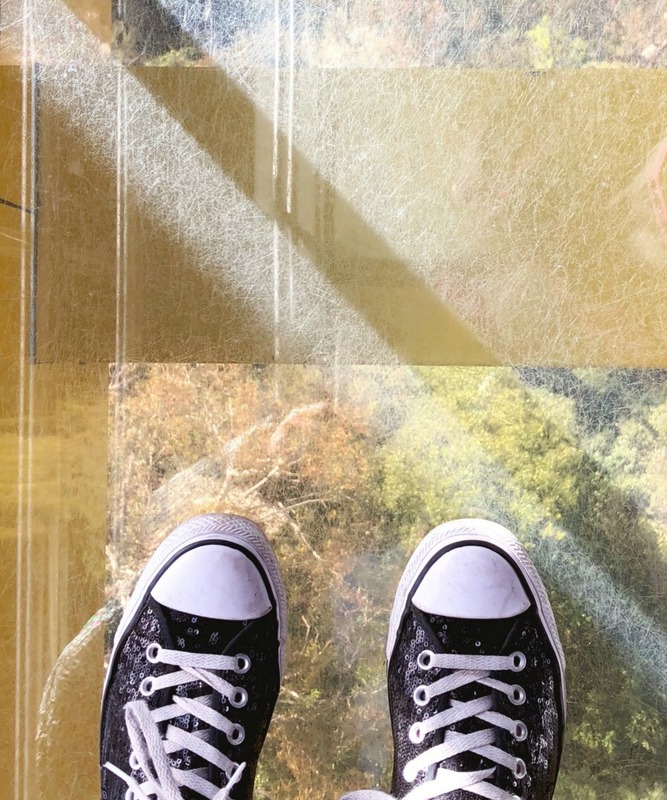 Are you afraid of heights? 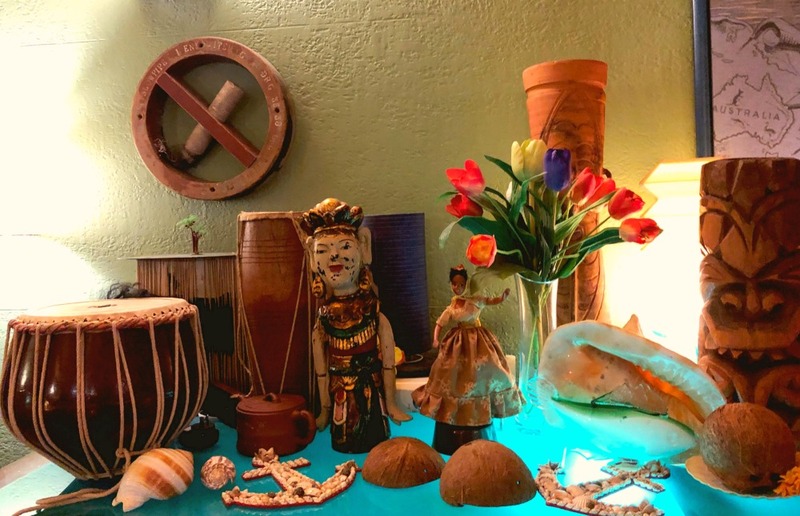 Do you have a spirit place and if so, where is it?! 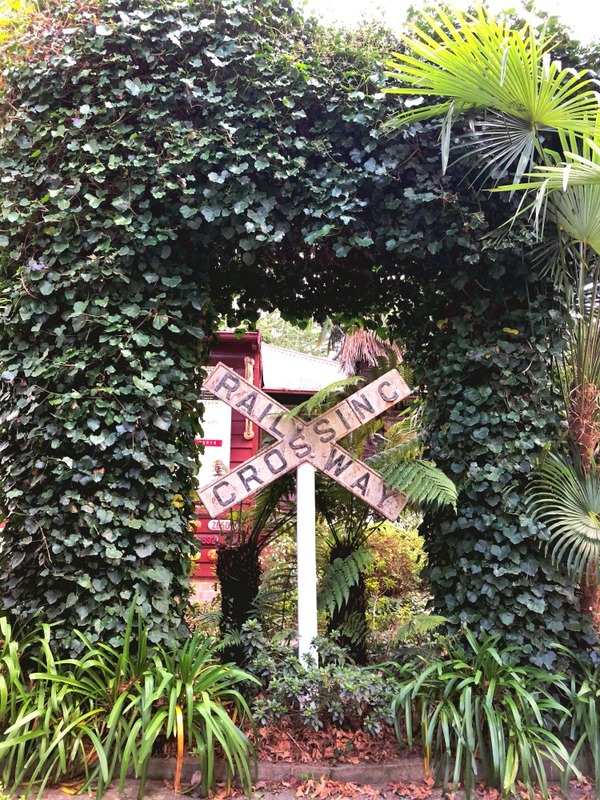 We were both guests of Scenic World and Leuralla Toy and Railway Museum. All food, drinks and accommodation were thoroughly enjoyed and independently paid for. As always, all opinions are honest and my own.